On June 30th, 2007, I wanted you. I wanted you bad. Well, truthfully, I wanted you or Scott Gomez. As an organization, the first line center was seemingly an unfillable void since 1997, when Mark Messier left for Vancouver after only a year of being reunited with Wayne Gretzky. Much like the Flyers can never find a goalie and the Canucks cannot win the Cup, it seemed the Rangers could not have an elite first line pivot. It loomed even larger in the 2007 off-season when, very much against Jaromir Jagr’s wishes, we let Michael Nylander and his army of 19 children walk, where he eventually signed a disastrous deal with the Washington Capitals. Jagr was past his prime then and couldn’t do it alone. He needed a new center and you and Scotty Gomez were the prizes of the unrestricted free agent class that season, and you both happened to be first line level centers. Never did I dream that we would acquire both of you. Never did I dream that it would quickly turn into a nightmare. 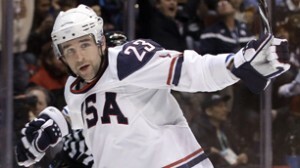 It was elating in the moment, though, watching you guys flip a puck to see who would wear #23. True, you had just ripped out Ranger hearts in the playoffs by scoring a game-tying goal in game five with 7.7 seconds left. But you grew up in Connecticut and, more importantly, grew up a Ranger fan. It was a coincidence that you scored a game tying goal with 7.7 seconds left, the same as the Devils’ Valeri Zelepukin did in 1994, though one that was impossible to not feel sore about in the moment as there was no Stefan Matteu to step up, only Maxim Afinogenov to twist the knife in our hearts deeper. 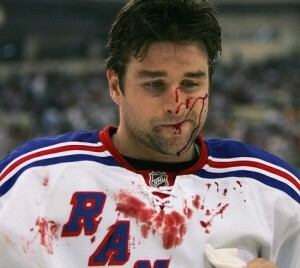 Gomez had his own issues, too, coming from the loathed New Jersey Devils, where he was regularly a Ranger killer. But he loved playing in the Garden, where he could take the puck from his own goal line, zip through the D untouched like they weren’t even there and put one right past Mike Dunham, or even Mike Richter and Henrik Lundqvist. He tallied 4 goals and 2 assists in three games at the Garden in his ’99-00 rookie season, including a hat trick the first time he stepped on Garden ice. Of course it’s not as easy to do that when you’re not playing against the Rangers D.
But neither you nor Scott could find a fit with Jagr. 25 goals and 33 assists for 58 was not a bad return, but not the 70 points we were expecting and the -3 plus/minus on a team where the only other players minus were the fourth line and a aged Brendan Shannahan was deeply worrying. Still, after Jagr left you were named captain. Rightly so. You were fulfilling the dream of millions in the NY Metro area—the entire sports fan world, really—to play for the team you grew up rooting for. In explaining your departure from Buffalo you explained to the fans that it was like a kid from Rochester being offered a chance to play for the Sabres. You had to take it. 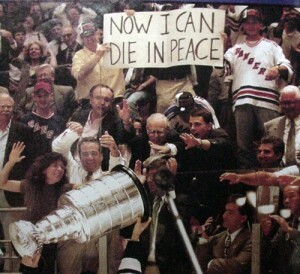 Just that fact made you instantly beloved by fans of a certain generation (mine, born in the early 80s and older), though your diminishing skills and silent, lead-by-example style did nothing to impress younger fans who were not sated by the Stanley Cup win in 1994 as my generation was. They could not identify with the famous “Now I Can Die in Peace” banner held up that night. They didn’t witness a cup. To them, you were supposed to be Captain Clutch, the Rangers’ version of Derek Jeter who would score key and late goals like the one you scored against us in the playoffs. You did have 7 game-winners, but there were not that many clutch goals to speak of outside of the one in Chicago in that ridiculously penalty-filled game, or the one in Calgary where we lost in a shoot out anyway. In the following three seasons, you had 3 combined game winners, as you morphed into something of a penalty killing defensive specialist, which, let’s face it, we could have just kept Jed Ortmeyer at $600k a season for if that’s what we needed. You and Ryan Callahan did Ranger fans proud at the Vancouver Olympics, but we wondered why you lacked that same drive when you played for us. We saw the same Cally on the ice at the Garden as we saw in Vancouver,, but you were different, like that jersey mattered more to you than the Ranger jersey. I’m sure it didn’t, but it felt that way at times. And then came the injuries. The concussions, the twice-broken finger that never really healed and the knee that had to be scoped that also never really healed, which limited you to 24 games played, 1 goal and 4 assists last season. Just not acceptable for $7.05m a season, and so Glen Sather was forced to buy out your contract for the Rangers to stay competitive. You’ll surely be missed, even though your time here was largely a failed experiment. You’ll be wished well on your new team (until you score against us) if your knee ever heals enough to resume playing. Ryan Callahan will probably replace you as captain either this season or next. Someone will be issued the #23, though I hope we keep it vacant for a season. But things move quickly in sports, Chris, and we’ve already spent your cap money on Brad Richards, who comes on a 9-year, $60m deal that, while exciting as he fills every need we have (veteran leader, elite, top line center and powerplay quarterback) is somewhat worrying when we think of the deals we made in 2007 with you and Scotty. Though his cap hit is a relatively tame $6.66m a season (maybe a little numeric payback for the Devils having 19,040 seats at the Meadowlands), the 9 year term is an awful lot to live up to in New York. Childhood Chris, who used to go to baseball practice in Rangers sweatpants en route to winning the Little League World Series, would think this was a good move to make. It was, sadly, the only move to make. I’m curious how many big name free agent prospects have come to New York and succeeded wildly. Now, between Brad Richards and Carmelo Anthony, there’s some additional excitement to that equation. Messier, Graves and Jagr are really the only big name free agents who have come to the rangers and succeeded wildly, I’d say. Lindros had formidable stretches when he wasn’t playing afraid of getting another concussion, but of course that’s when he’d get another concussion. The jury is still out on Gaborik. It’s worked out much better for the Ya Kees, of course, and even The Mets to some extent (especially in the 80s).